A sign of the political times in the Ozarks has many questioning the message ... And the source. This billboard is on US 63 in the Howell County Community of West Plains. 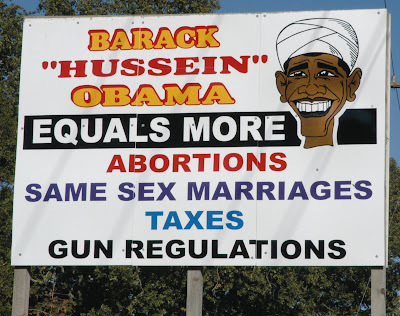 No one has claimed responsibility for putting up the sign, but Howell County democrats are upset at the image of Barack Obama in a turban. Obama has fought internet rumors that he's Muslim. He grew up in a Christian family. The West Plains Daily Quill gave us this picture. The paper quotes billboard owner Ronnie ford as saying he doesn't know who put up the provocative message. Very rarely does one see such an informative billboard. Ripping it down would just be another case of the Obama goon squad censoring free speech in America.